It’s an unlikely combination, but one that works. It’s spring here in Texas, weather-wise if not quite calendar-wise yet. With all this beautiful weather comes a flood of fresh produce that no longer requires considering a second mortgage, unlike that sad-looking, coffee stirrer-thin asparagus for $5/lb that was out barely a month ago. Strawberries are abundant, wonderful, and on sale everywhere right now. But since some of my favorite strawberry recipes involve flour and sugar – two things that I’m trying to avoid right now – we decided to try to be a little more creative and focus on more on non-baked-good alternatives. Enter Strawberry-Avocado Salsa, stage right. We whipped up a batch for a tortilla- and chip-less (but not margarita-less!) taco night on the patio – and it was pretty perfect. There’s a lot going on with the salsa: heat from the pepper, the sweetness from the strawberries, the richness of the avocado, and the acidity from the citrus. And all that goes on top of smokey, grilled salmon filet. A white fish would work pretty perfectly, too. And so would chicken. A tortilla might make it even better… as would a side of tortilla chips to handle the leftover salsa. 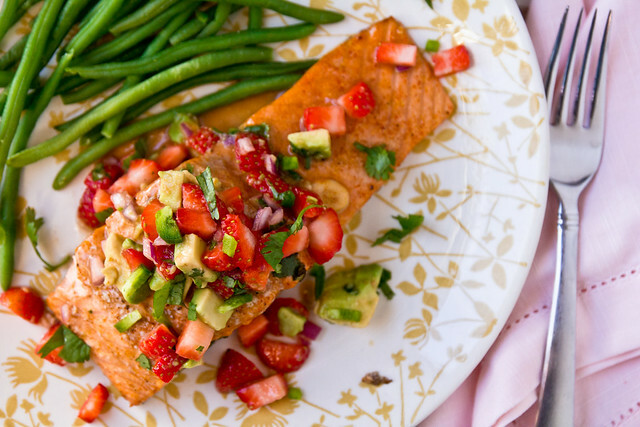 Smokey grilled fish topped with a sweet-meets-heat salsa of strawberries and avocado. In a small bowl, whisk together the marinade ingredients and then transfer to a shallow dish. 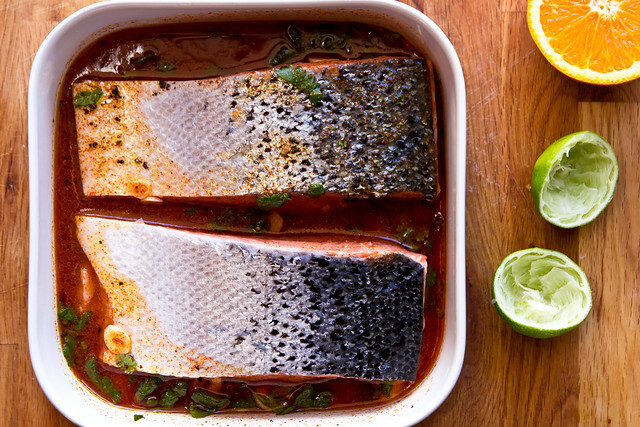 Transfer the fish to the grill, skin-side down and cook for ~10-12 minutes (4-6 under the broiler), until the thickest part of the fish is opaque. While the fish is cooking, stir together the ingredients for the salsa in a medium bowl. Serve the fish, seasoned with additional salt & pepper, topped with a generous scoop of salsa. I can see myself making this all summer long and putting it on everything! Looks amazing! Ohhh… this would be great on some fish tacos! I can’t wait until strawberries start showing up in our CSA delivery. What a lovely combination of most of my favorite foods! Will put this on my must-do dinner list for sometime this week. I have seen strawberry and salmon before, which always looked a little icky to me. The addition of avocado may have sold me! This looks so good! Strawberries are in season here too – (Florida), and I also am a sucker for anything sweet + strawberry, so nice to see a way to work them into a savory dish! I love avocado too. . . . hmmm. Maybe dinner this week! I really hope some of these fabulous strawberries make their way up here to the northeast!! I miss them so much. And I love the sound of this salsa. I made a strawberry salsa last year also and the sweet and spicy pairs so perfectly together! I love this because it looks like a taste of summer-yum! 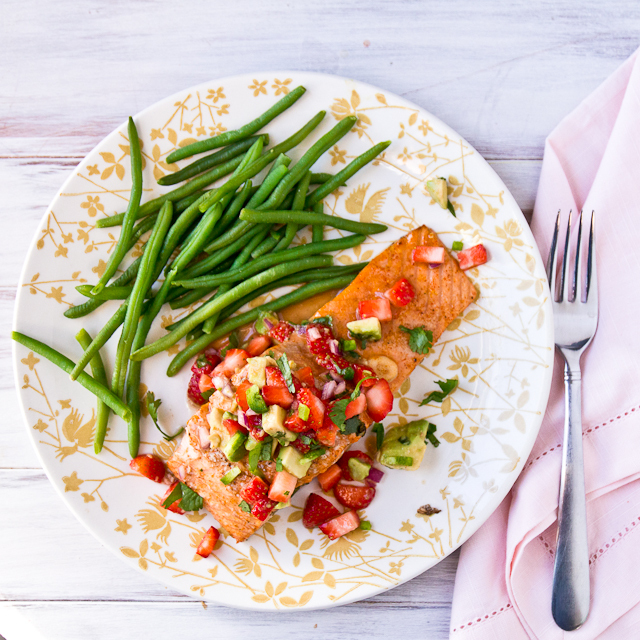 I’m not much of a fish person… but strawberry avocado salsa is right up my alley! And it’s gorgeous, too! This looks amazing. More so, your photos are absolutely beeeeautiful!!! This looks so delicious, I love everything about this meal, strawberries and avocado are my favorite! I saw this recipe this afternoon and had to try it! I was sitting on a ripe avocado and big ol’ box o’ strawberries that I had to use today- perfect! I did tweak the recipe, using chicken breasts instead. I also used 1/2 a lime in each for the marinade (instead lemon with the salsa), and added polenta as a starch (with cheese, milk and chicken boullion) and I also boiled down the reserve marinade and poured it over the sliced chicken and polenta. The salsa is so refreshing! Great sweet with the salt and smoke of the rest of the dish! Thanks for a memorable meal! Had this last night for dinner and LOVED it! Really enjoyed the light & refreshing flavors. We’re going to have the rest of the salsa over tilapia tonight! Made this tonight for my family. It was the salsa that caught my eye. Thank you for a DELICIOUS meal! Thanks to you my son likes avocados now :). I found the recipe on food gawker. sounds absolutely delist and can’t wait to try it!!! We made this for dinner tonight and it was delicious! And fresh and different too! 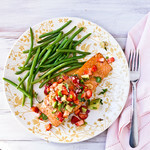 The salmon with the salsa is really a nice combination. I loved the balance of flavors and textures in the salsa it really works well. We served this with asparagus and sweet potato rounds (par-cooked) that we tossed in the marinade before putting on the grill. The sweet potatoes were also really good topped with the salsa! I’m sure we’ll be making this dish again before spring is over!